I may have a slight obsession with miniature foods...bite sized anything is just so cute!! That is why I am crazy right now about tea sandwiches. As far as I am concerned, there isn't a need for two pieces of bread to contain all the flavor, so I am doing open face tea sandwiches--they save time and I feel the presentation is just fabulous. These are just a few suggestions for your tea sandwiches, of course. The possibilities are literally endless. Best of all, tea sandwiches are great for so many occasions; you can have them as a light lunch, an appetizer, for a tea with your family (as I did! ), or for brunch with some breakfast themes. However you decide to serve them, your guests will be impressed by your cute little tea sandwiches and you will feel like the tea sandwich warrior you are! These are further made easy by the fact that your guests can build their own, saving you time and heartache in the guessing game of what people like. Now for your bread. I like things to look fancy. So I myself a set of biscuit cutters and they come in handy in a situation such as this... Cut your rounds out of regular sandwich bread. I used wheat, but you can use white or rye, or a mix of anything! There was a lot of bread crusts leftover, so I saved them for bread crumbs. I laid the sandwich rounds out on a tray. I also added a plate with cream cheese and pepper jelly (because that goes great on the tea sandwiches with the cucumbers,) and I added some homemade pickles for garnish. I'm ready to build my sandwiches! Garnished, of course, with a sliver of homemade pickle. Time: 15 minutes | Serves 4-6 for Tea | Difficulty: Easy! Cheese- I used blue cheese crumbles and mozzarella cheese, but you can use anything. 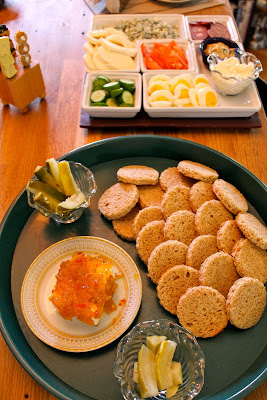 On a small plate, place your cream cheese and top with pepper jelly. Set aside. Slice your cucumbers, tomatoes, and onion. Place them on a serving tray. Add your cheeses, mayonnaise, and mustard. Put pickles in a serving bowl for garnish. Slice your hardboiled eggs and place them on serving tray. If desired, lay out meat as well. This stores well in the fridge while you are waiting or assembling bread. Using a biscuit cutter, cut out rounds from your loaf of bread. Save crusts for bread crumbs, if desired. Lay out your bread rounds on a tray.